Designed by ladies for ladies, the Ladies Automatic collections reflect their values and aspirations. 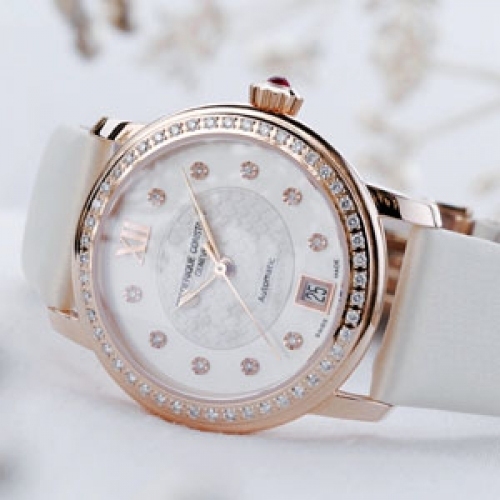 The Double Heart Beat and Love Heart Beat lines are distinguished by a shaped opening on the dial, while the Classic line features finely worked, diamond-set mother-of-pearl dials with guilloché hearts at the centre. Refined, delicate timepieces, with discretion and sophistication the key words, they have round, elegant cases and a transparent back through which to admire the automatic movement. For each model sold, Frédérique Constant will donate the equivalent of the cost of a child’s heart scan, which could save the child’s life. An iconic timepiece with a large heart!